Share3D On-Premise is a local server solution for delivering 3D-enabled HTML5 documentation created with Pages3D, Publisher3D and Document3D Suite. Deliver documents using industry standard HTML5 empowered with WebGL. No plugin required. View content with Chrome, Firefox, Internet Explorer, Edge, Chrome or Opera on PCs, Macs, Androids and iOS devices. Use QuadriSpace authoring software to create fully customized, multiple-page interactive 3D documents. 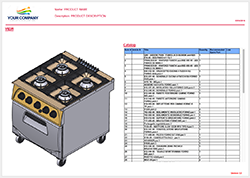 Create a part catalog with easy drill down from complex top level assemblies to manageable subsets of parts for easy part selection. Publish your step-by-step instructions online for improved communication and fewer assembly errors. A powerful 3D-focused alternative to PDF documents based on industry standard HTML5 and WebGL. Create and customize the order of hierarchical topics. 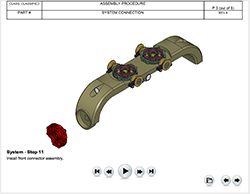 Create links from one topic to another so that common 3D documentation can be reused. 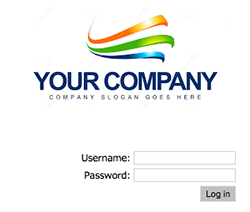 Customize the overall look and feel of the web experience blending the server generated pages in with your corporate branding. Set up your server for general access web pages or limit access to teams or customers only. Create a corporate portal for shop floor assemblers, field support representatives, dealer networks, customer documentation and more. Simple file management utilities make it easy to upload files and then customize the order that the files are listed. Simple versioning tools keep track of version changes and make it easy to access the most recent version of your 3D document. Setup as many users as you need and choose individual access permissions and passwords. Share3D On-Premise is installed on your own server, leaving your company in direct control of performance, security and content. Create links from one document managed by Share3D On-Premise to another making it easy to access reference material. 3D-Enabled HTML documents provide a powerful solution for assembly instructions, spare part catalogs, service portals, customer documentation and much more.